Opwindende Nuus Vir Nommer 37! Lindley Heynes, ook bekend as LINKRIS THE GENIUS, is ’n Suid-Afrikaanse kletrymer van die Kaapse Vlaktes. Hy gebruik Afrikaanse en Engelse lirieke om prentjies te verf vir sy stories. Die sanger beskryf homself as ’n “sosiaalbewuste boom-kletsrymer” en noem sy musiek “wortelmusiek”, omdat hy dit as ’n voertuig en platform gebruik om die mense in sy gemeenskap te bemoedig. Hy is ook bekend vir treffers soos Game Change, Meditasie en Omdat Ek Kullid Is. ivid images to tell his story. He labels his music "wortel musiek" or "roots music" because he uses his music as a vehicle and platform to instill; confidence, strength, unity and pride into the members of his community, which is ALL Coloured people in South Africa and abroad.ivid images to tell his story. He labels his music "wortel musiek" or "roots music" because he uses his music as a vehicle and platform to instill; confidence, strength, unity and pride into the members of his community, which is ALL Coloured people in South Africa and abroad. Exciting Times For Number 37! 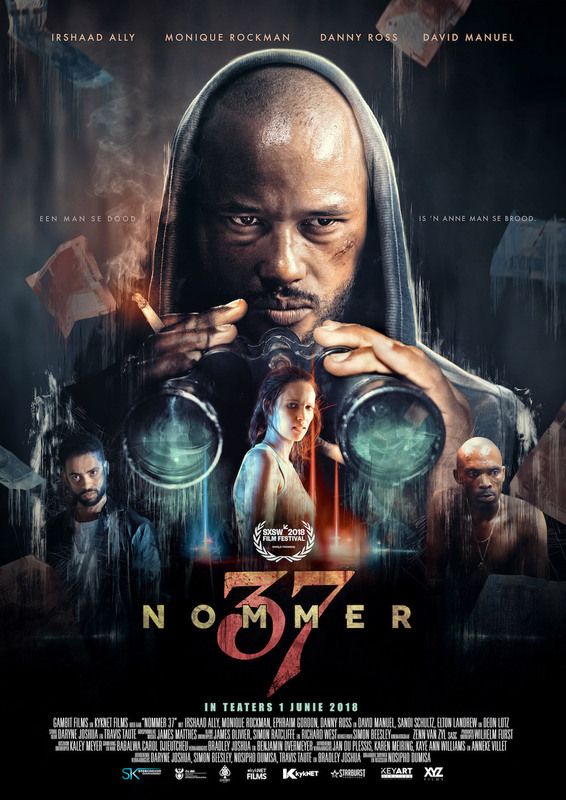 The Ghoema nominated rap artist, LINKRIS THE GENIUS, has just released a music video for his hit, NOMMER 37, which is also the official theme song of the blockbuster, NUMBER 37. This intriguing rap song perfectly captures the mood of this crime thriller and was therefore the obvious choice when the soundtrack was compiled. NUMBER 37 is also available on BoxOffice and DVD from September 2018 and the video release was scheduled specifically to accompany this memorable release. Lindley Heynes aka LINKRIS THE GENIUS is a South African Rap artist born and bred on the Cape Flats, Cape Town. He uses both the Afrikaans and English languages to paint vivid images to tell his story. The artist describes himself as a “socially conscious boom rapper” and labels his music as “route music”, because he uses it as a vehicle and platform to instill unity, pride, confidence and strength into the members of his community. He is best-known for hits like Game Change, Meditasie en Omdat Ek Kullid Is. ivid images to tell his story. He labels his music "wortel musiek" or "roots music" because he uses his music as a vehicle and platform to instill; confidence, strength, unity and pride into the members of his community, which is ALL Coloured people in South Africa and abroad.ivid images to tell his story. He labels his music "wortel musiek" or "roots music" because he uses his music as a vehicle and platform to instill; confidence, strength, unity and pride into the members of his community, which is ALL Coloured people in South Africa and abroad. In addition to the exciting announcement of the music video and DVD-release, accolades are still streaming in for director, Nosipho Dumisa, who was recently awarded the Silwerlens Award at the annual Silwerskermfees in Cape Town. She also won the Cheval Noir Jury Prize for Best Director at the Fantasia International Film Festival in Montreal, Canada, last month for her debut motion picture. This production, which had its world premiere at the International SXSW Film Festival in Texas, was selected to represent the country at the 18th annual Neuchâtel International Fantastic Film Festival (NIFFF) in Switzerland from 6 to 14 July 2018 and also featured at the Sydney Film Festival in June 2018. Dark Star Pictures gained exclusive North American distribution rights for the film earlier this year. The North American screening of the full-length feature will kick off in New York and L.A., followed by an early winter video-on-demand release. Reel Suspects has also managed to clinch distribution deals for the film in China, Germany, Austria, Switzerland and Japan. NUMBER 37 is a thrilling big-screen cinematic experience based on the SAFTA-award-winning short film of the same name, which was co-directed by Nosipho Dumisa and Travis Taute. It is one of those movies that will keep viewers on the edge of their seats until the credits start rolling and tells the story of Randal Hendricks, a recent paraplegic, who is given a gift of binoculars by his devoted girlfriend, Pam (Monique Rockman). But he is in financial debt to Emmie (Danny Ross), a sadistic loan shark, and when he witnesses a powerful criminal, named Lawyer (David Manuel), commit murder while observing his neighbours through his binoculars, he initiates a blackmail scheme in an attempt to settle his debt. With deception and greed around every corner, what follows is a thrilling ride that puts both their lives in mortal danger… as the world around Randal deteriorates further and further into chaos. The film was produced by Bradley Joshua and Benjamin Overmeyer of South African production outfit Gambit Films in association with kykNET Films, M-Net, XYZ Films and the DTI, and was distributed by Filmfinity (Pty) Ltd. locally. Sandi Schultz, Deon Lotz, Elton Landrew, Ephraim Gordon and Amrain Ismail-Essop can also be seen in this motion picture. The DVD will be available for hire on BoxOffice from 3 September 2018 and will be available for purchase from retail outlets from 7 September 2018.